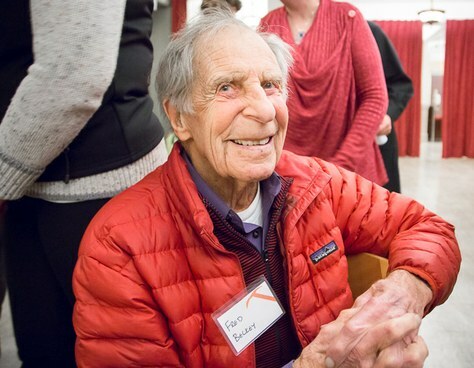 Fred Beckey, a living legend among Northwest Mountaineers, is a climber, environmentalist, historian, and author. He's recognized as the most imaginative, persistent, and thorough explorer and mountain investigator of the Cascade Range Wilderness. 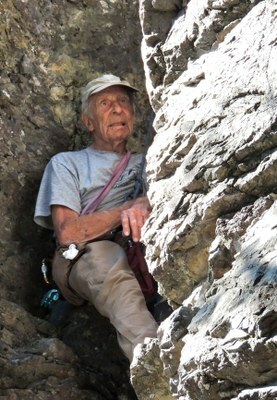 He was noted as “one of America’s most colorful and eccentric mountaineers,” and is unofficially recognized as the all-time world-record holder for the number of first ascents credited to one man. Mountaineer climbers in 1939 were well aware of their unparalleled good fortune. Only the highest Northwest peaks had been climbed, and all a young climber had to do to score a first ascent was head for the nearest blank spot on the map. Many of the mountains hadn’t even been surveyed, and the climbers often went without benefit of a map. Often they explored the area first and returned later, relying on their own notes to reach the summit. “Mushroom Tower, 8,400 feet, could have no other name because it was just that. A stratum of soft rock has worn out, leaving the dome sitting on a thick column with an overhanging pitch all around. It appears unclimbable except in one spot. And this pitch, Fred and Helmy insist, is the toughest one they have ever climbed. “From a platform as big as a table, a three-man shoulder stand had to be used to get Fred over the 12-foot overhang onto a 10-foot slab that wasn’t more than 70 degrees but had no holds or piton cracks. How Fred wormed up by traction of the palms of his hands at hip level, with legs more or less useless, is a mystery to him, too. Helmy and Walt had to climb up the fixed rope. This was an excerpt from Mountaineers: A History by Jim Kjedlsen with a forward by Mary Hsue, Director of Development. It originally appeared in our March/April 2015 issue of Mountaineer magazine. To view the original article in magazine form and read more stories from our publication, click here.